"The xeedho is a wooden eating bowl commonly found in all nomadic households in Djibouti. At weddings, the bowl is filled with a palatable dish (called the muq-mad - which is the beef jerky Somali style) prepared of sun-dried meat which has been fried in butter and seasoned with spices and to which dates are added in large quantities. The muq-mad, recognized to be a delicacy, is a nutritious, life giving foodstuff and is especially appreciated by the nomadic community. It lasts for a long time and thus serves as a reserve food in nomadic households, often being given as a treat to distinguished guests. At the xeedho ceremony, the basket is given a human form. It is “clothed” in a similar attire to that of the bride, brought to the wedding by her relatives. The bowl with the dish is usually stored in a basket consisting of two conical baskets joined at right angles, covered with a piece of tanned leather or white cloth, nicely decorated with cowrie shells and tied together with leather strips and cords in a very complicated way. Under the direction of an unmarried woman "presiding" over the ceremony, every young male of the groom's family is called to try to untie the rope. The woman overseeing the ceremony watches carefully each young man's attempt to find the knot and untie the rope. If the woman judges the attempt too brusque, or unconvincing, she sentences and applies a form of "punishment" varying from reciting poetry to dancing. When the ceremony is successfully finished, people join together to feast and celebrate. The ceremony is celebrated on the seventh day of the marriage. It concludes the whole wedding ceremony. 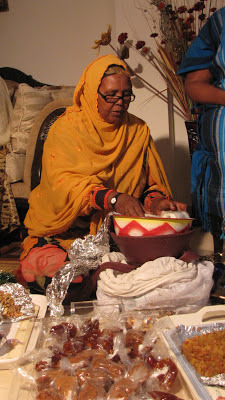 The xeedho is a gift given by the mother to her daughter and son in law and the goal is to promote social cohesion." The xeedho ceremony I attended was a ladies-only event (with the exception of a brief appearance of the groom and a couple cameramen who came to capture the memory) and primarily done as a way for her to include her foreign friends--most of whom weren't at the wedding-- in the celebration of this new chapter of her life. If I were to sum it up in one word I'd say "Delicious." In my forth month of pregnancy my husband Stuart, anxious that our time in Zambia was coming to an end, insisted that we take a big road trip to explore Northern Zambia. The adventurous week on the road produced many amazing stories and ended with an exciting finale (i.e. our flipped and totaled SUV on a bad remote road). I should write about them in detail one day, but for now I'll share Stuart's description of the route we took. If you ever have the chance, we suggest you try it. The Great North Road. Its imperial title evokes classic adventure the length of Africa. While the Cape Town to Cairo route of Cecil Rhodes’s dreams never quite came to fruition, the section of it in Zambia is the country’s equivalent of Route 66, and links all Zambia has to offer. Heading north from Lusaka, one will see spectacular waterfalls, ancient cave drawings, a Bemba chief whose great grandfather buried Dr. Livingstone’s heart on his land, a grand colonial estate, a tropical beach resort, historic roadside monuments, and this author’s favorite spot in Zambia: the hot springs where one can sit in the effervescent warm waters beneath a magnificent African night sky. Depart Lusaka mid-day (e.g. after work on Friday), driving to Mkushi. Overnight at the Forest Inn. A simple but charming lodge with cottages in the forest, just off the main road. Leave early in the morning to drive northwards. 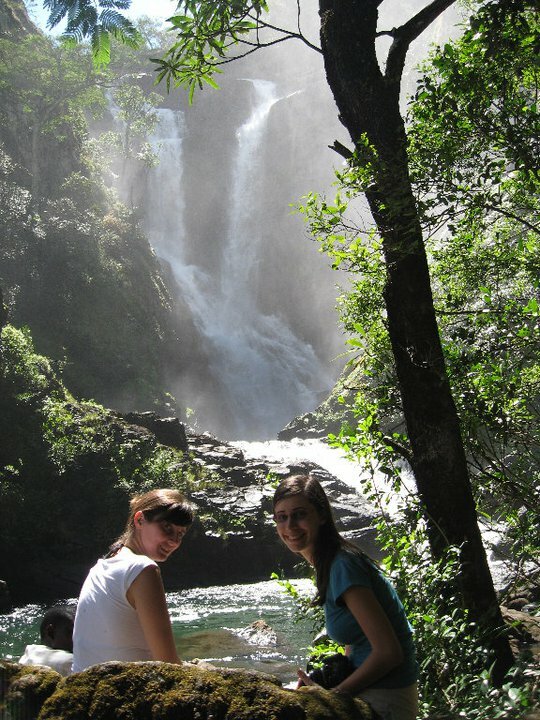 Just past the Serenje turnoff, stop at Kundalila waterfalls. Hike down to the base of the falls and back. 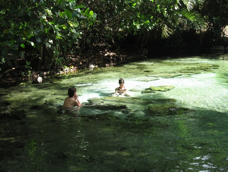 (An on-site guide can point you in the right direction after you pay the nominal entrance fee.) 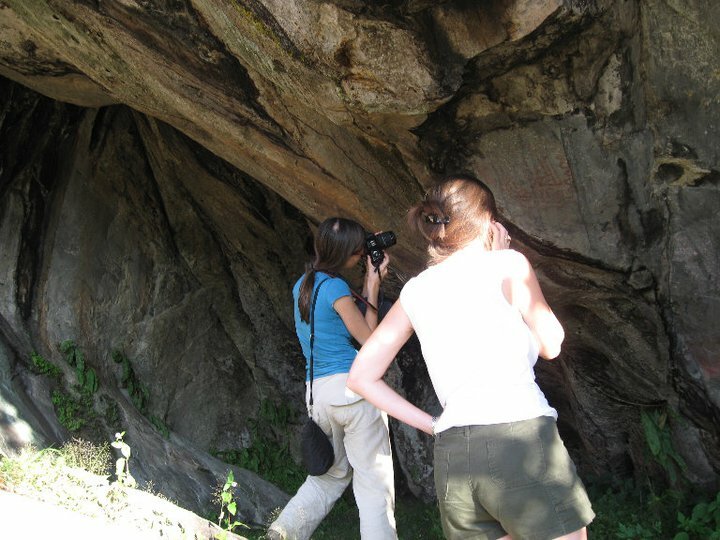 Consider a stop at either Nsalu or Nachikufu caves (probably not time for both) to see prehistoric rock paintings. (You will need the on-site guide.) Past Mpika, turn left off the Great North Road when you see the signs to Shiwa Ngandu. Many of Northern Zambia's rock paintings are 10,000-20,000 years old! 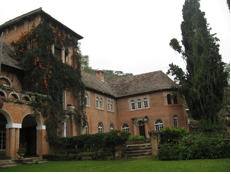 Famed Shiwa N’gandu estate is a magnificent English country manor house dropped into a remote part of Zambia. Its history is thoroughly documented in Christina Lamb’s Africa House, which tells the story of Stewart Gore-Brown, a man with big dreams, and still the only white man to receive a state funeral (post independence) in Zambia. It is a working farm run by Gore-Brown’s grandson, Charlie Harvey and his wife Jo. Overnight: Shiwa N’gandu estate. The cost is high, but then this is not really for average travelers needing a bed. It’s for history lovers. Dining with the Harveys in their beautiful dining room is akin to joining a family dinner. There is a choice of activities on the estate. Go on a safari drive with Charlie; no, you won’t see roaming lions, but where else can you do a safari with three beloved ridgebacks straining past you to see out, with a Jack Russell on your lap? Go for a horseback ride with Ms. Harvey up to Gore-Brown’s hilltop gravesite, or hike up to the second highest peak in Zambia, just as Dr. Livingstone did. See their working farm, or simply sit in the library, sipping sherry, and delve in to Gore-Brown’s original photo albums, or inspect his diaries in the tower room. In the later afternoon, depart the main house and drive down the road to the adjoining Kapishya Hotsprings, owned by Charlie Harvey’s brother, Mark. After an excellent family-style dinner at Kapishya, including chatting with the Welsh manager and other guests, sit in the bath-tub temperature waters of the hotsprings. Overnight at Kapishya Hotsprings where they have a lovely pool and gardens. Visit Kalambo waterfall (2nd tallest in Africa; twice the height of Victoria Falls). The lodge can arrange a boat to get closer and from there it is a rather strenuous guided hike that takes several hours. (Those less fit might consider just driving to the falls after leaving Lake Tanganyika). Take lodge skiff back to Mpulungu. 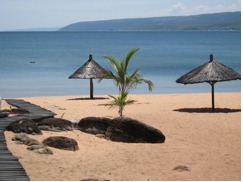 Those with an extra week in their itinerary might want to take the MV Liemba from Mpulungu to Kigoma, Tanzania. The Liemba, a German-built steamer, has been plying these waters for almost 100 years and visits Mpulungu once a week. Sunk by the British during W.W. I and then raised from the bottom to serve as a passenger and cargo ferry, this ship (along with two other German warships) served as the inspiration for the warship featured in the story “African Queen.” Aside from the Liemba, it’s also possible to negotiate passage on one of the cargo ships. In Mpulungu, on a hill above the port, visit Niamkolo church, established by the London Missionary Society and the oldest church in Zambia. (The stone church is currently missing a roof). Near here is also the remains of the Good News, the first missionary boat, although we were unable to locate it. Drive south to Kasama. On the eastern outskirts of Kasama, visit Mwela Rocks. A guide at the entrance will join you in the car to point out various ancient cave drawings, including unmistakable fertility depictions. Sadly, some of the cave drawings were lost in the 1970s as the Chinese builders of the Tazara railway thought the rocks had more value as railway trestles. Overnight at Thorntree Guest house, a simple but pleasant establishment run by a former British schoolteacher. Drive westwards toward Mansa. 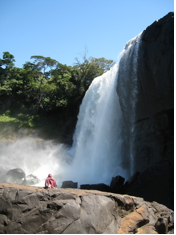 Not far outside Kasama, stop at Chishimba Falls, a highly accessible set of three dramatic waterfalls. 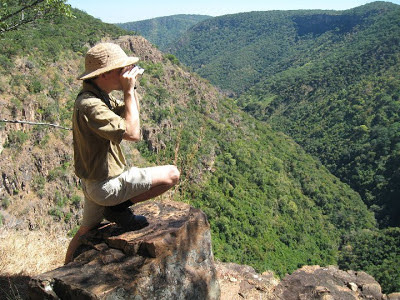 At the middle waterfall, with some caution, one can walk across the rock plateau next to where the water goes over, for a classic African vista down the gorge. Overnight at Bangweulu Bay Lodge (just outside Samfya), one of the few such lodges owned by an African-Zambian. Enjoy hot tea and biscuits watching an orange moon rise over Bangweulu lake, the largest natural lake in Zambia. The next morning, sit on the sandy beach and watch a shimmering sunrise over the lake (but you may not want to swim in the lake). Drive south on the excellent road that cruises past the Bangweulu wetlands (and passes over the longest bridge in Zambia). Just before Kasanka park (known for the spectacular bat migration, at the right time of year) you will see a turnoff on the left for the Livingstone Memorial and Chief Chitambo’s Village. Chief Chitambo’s palace is just one km from the main road and it’s well worth it to have an audience with this English-educated and forward-thinking chief. His great-grandfather was with Dr. Livingstone when he died. 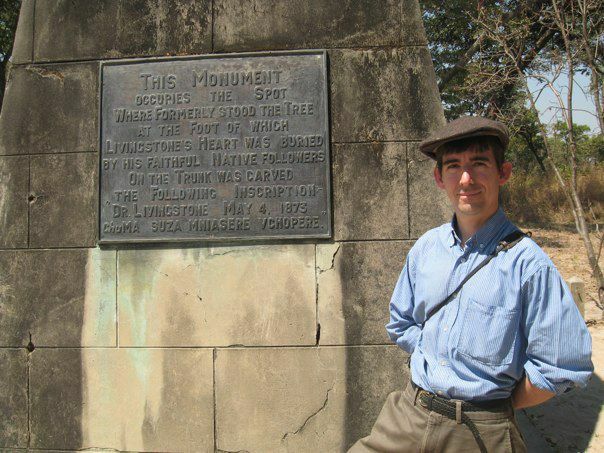 Any history aficionados will consider the 25 km dirt road (in good condition) well worth it to reach the actual monument where Livingstone’s heart and other organs are buried. (The rest of him was taken back to Westminster Abbey in London.) After returning to the main road, continue southwards, rejoining the Great North Road, towards Mkushi. Overnight at the Loza Guest House, a renovated British farmhouse that provides excellent meals. It’s a 10km dirt road off the main road. An alternate, simpler lodging is Serenje’s Mapontela Guest House, which was started by a former Peace Corps Volunteer. -Stuart Denyer (former Vice-Consul who immensely enjoyed exploring Zambia). It has been pointed out to me that I haven't blogged in a long time. These days I mostly share my adventures via Facebook. That said, not everyone regularly reads FB newsfeeds and not every story can be summed up with a status update or a captioned photo album. So, perhaps I'll start again and begin by telling some of my favorite stories from where I left off. Not long after my last blog post I discovered that Stuart and I would soon become parents. 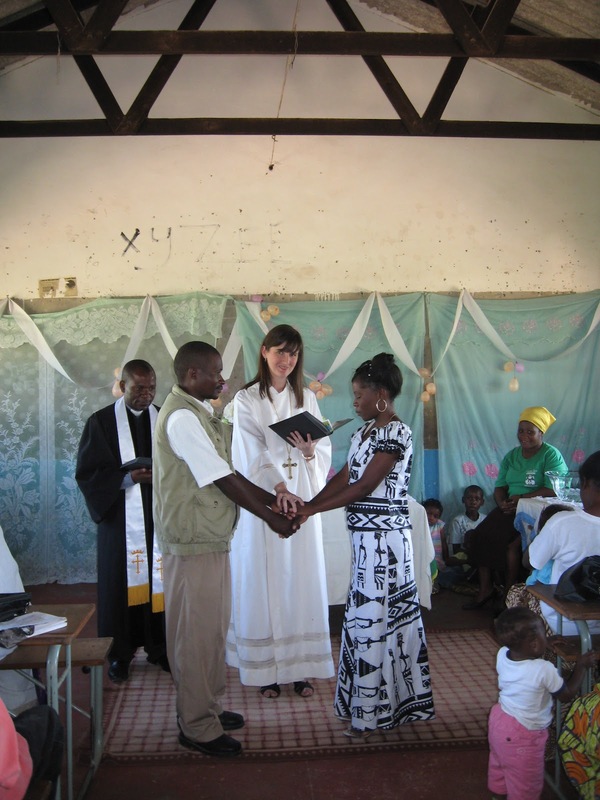 I had a rather rough first trimester, but we wanted to hold-off on announcing the pregnancy, so I tried to mask my illness and continued with my church work in Lusaka. 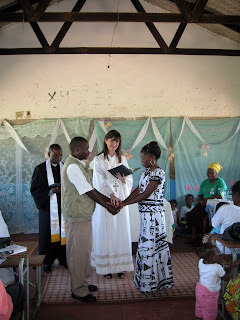 In fact, when the pastor of the main United Methodist congregation in the district said he could no longer handle his commute due to the heavy rains and bad roads, I was appointed as senior pastor at Matero with the deal that when the roads finally dried I could leave town for my commitments in Indiana and Congo. No longer itinerating around the district allowed me to journey through all of Lent and into Easter with the same congregation. The experience had its challenges (like marching all morning on a hot day in a heavy robe in an ecumenical Palm Sunday parade while battling morning sickness), but it overall it was wonderful. Together we explored how to enrich our Lenten journey and made plans to make Easter extra special. My husband and I have a tradition of inviting embassy friends to our house for a Maundy Thursday dinner followed by a contemplative Taize service and Passion reading. When I arrived at church (visualize a rented classroom in a poor part of town) the next morning to lead the Good Friday services, the Taize hymn “Jesus, Remember Me” was still floating through my head, so I decided to introduce it to the congregation. The result was powerful. I had never experienced Taize like this; it brought tears to my eyes as the song swelled pentecostally and morphed into what it was intended to be—an intense communal plea for Christ to not abandon us. The service and song became one; spoken reflections on the Passion and scripture readings served as short rests between its refrains. It is moments like this that make me feel incredibly blessed to work in a setting where contexts collide and enhance each other. On Easter morning I arrived with decorations from home (wedding crystal, silk flowers and tablecloths) and was delighted to find our normally shabby classroom had already been transformed by the women of the church. Pink toilet paper, salvaged balloons, curtains from their homes—everything they could gather had been used. I was honored that morning to officiate the baptism of ten children, ritually bless a common-law marriage and welcome three new members. What a day! The members were still talking about it with pride and enthusiasm when interviewed by a visiting American pastor months later.